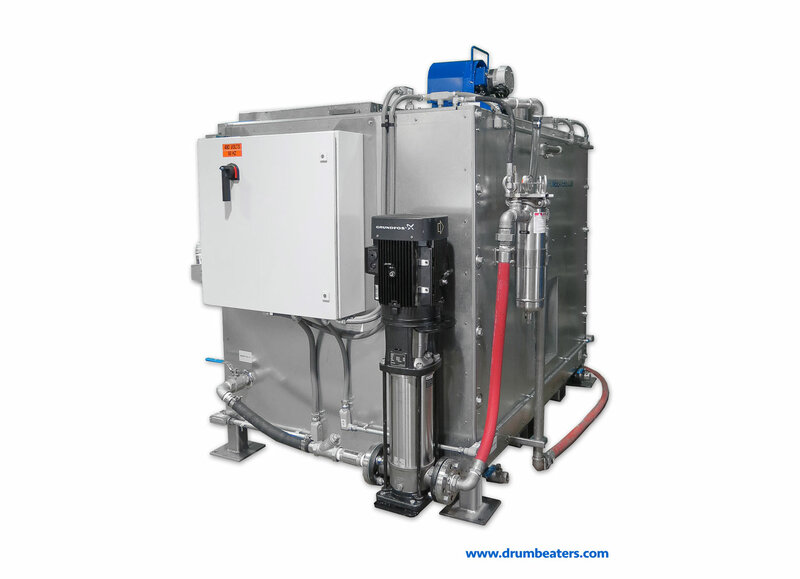 The RTF-500 Multi-Media Filtration & Recirculation Tank System can be used with all of our washing systems and can also be used with our special water based cleaning solvents and degreasers. 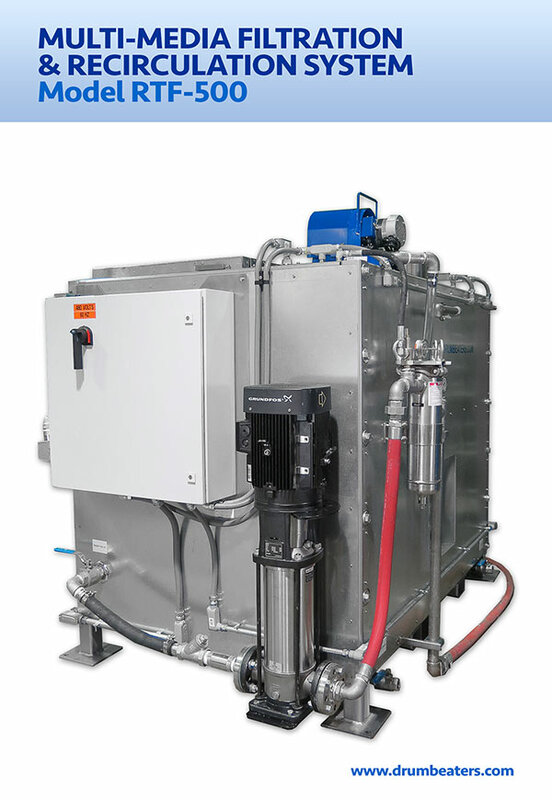 The RTF-500 is a versatile system that is designed to not only recirculate the wash fluid but to also clean the wash fluid using a combination of flocculation and a multi-media filtration bed. Flocculation is a process by which fine particulates as small as 20 µm in size are caused to clump together into a "floc" in order to remove the fine particles from the wash fluid. The clumps of "floc particles" float to the top of the wash fluid in the flocculation tank. Then, as wash fluid flows into the flocculation tank, the "floc particles" flow over a weir and onto a special "no clog" membrane that is laid over the "birds eye" stones in the multi-media bed filtration bed in the RTF-500. Refer to the Section View of the RTF-500. Once the solid waste material is captured on the multi-media filtration bed, the solid waste can be collected and discarded. 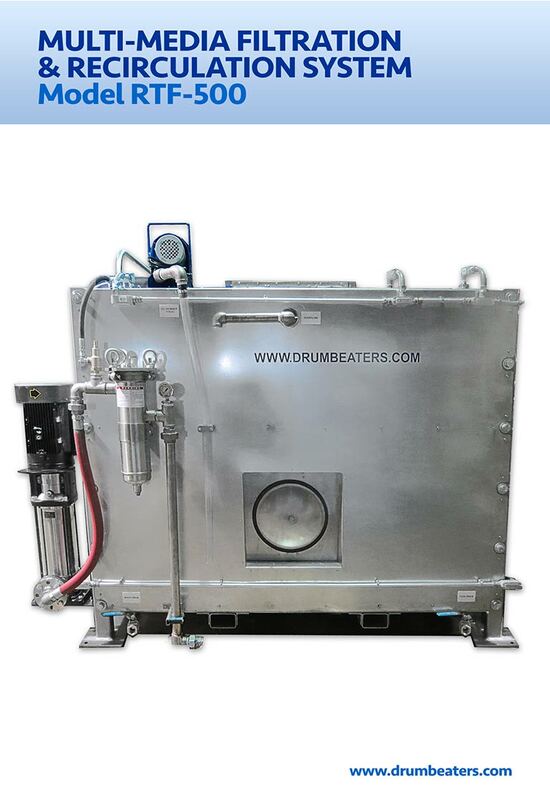 This unique process allows for the continuous use of the wash fluid and therefore does not increase the liquid waste stream since the wash fluid is not discarded. The amount of solid waste is minimal and can be disposed in a landfill. Sometimes users encapsulate the solid waste by mixing small quantities of cement/Portland with the "floc particle" solid waste or the solid waste is tumbled dry in a mixer such as a mortar mixer. 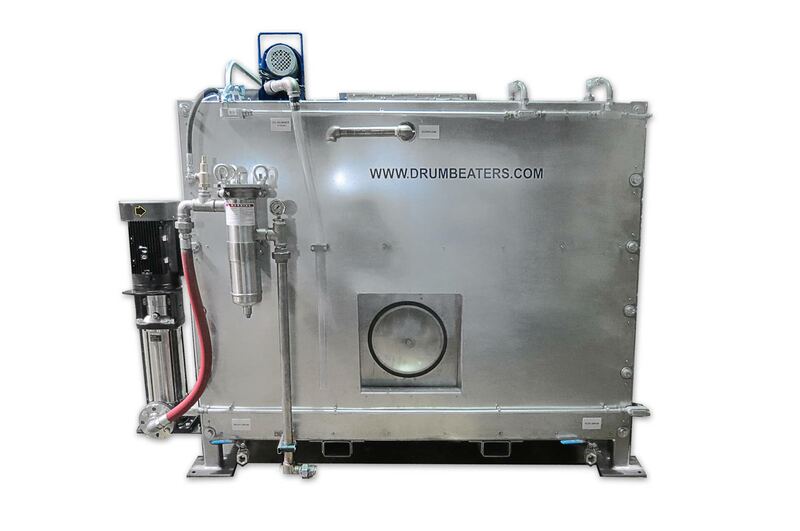 Please consider the following information: type of drums (steel, plastic, open top, close top, sizes, etc), number of drums processed per hour, waste inside of drums, intended cleaning solution (water, hot water, solvent, caustics, etc) and electrical requirements (Volt & Hz). Our solutions are popular with large, middle-sized and small companies. Our equipment and systems have been shipped to many parts of the world. Below you will find some of our clients. Copyright © 2017 Drumbeaters of America Inc. All Rights Reserved.